If you stand at the Mergellina harbor at the eastern end of via Posillipo and decide to walk west all the way up that road to the end, where the cliff overlooks the town of Bagnoli and the Bay of Pozzuoli, it will take you a little over an hour at a reasonable pace. You will walk through what seems to be a solid stretch of housing. (The mass of buildings in the center of the photo, right, is at that eastern end of Posillipo above the Mergellina harbor and is an area particularly built up). The buildings may be old or new, large or small, beautiful or very ugly, but it is an unbroken chain on both sides of the street, as well as up the slopes to your right and down the slopes to the sea on your left. Even if you get in a boat and get out to a point off of Cape Posillipo and the small harbor of Riva Fiorita (photo, left), the entire Posillipo hillside from the height that overlooks the isle of Nisida on your left back down to Mergellina on your right looks completely urbanized—with maybe a few flecks of green here and there (especially the large Villa Rosebery directly in front of you—the trees behind the photo, left). It is not at all evident that there are still patches of farmland, but there are, especially at the extreme western end of the hillside (photo, right), or that there were ever separate “old communities of Posillipo,” but there were, indeed. Most of the urban sprawl that you see is from the last 100 hundred years and most of that is since the end of World War II. Indeed, for many centuries, there was no really convenient way to get to Posillipo except by boat. That’s why the first real settlements were along the coast. The long vehicular road, via Posillipo, that you have just walked along did not even exist until the early 1800s. Before that, there was the infamously steep and winding rampa di San Antonio (photo, left) at the eastern end behind the church of S. Maria di Piedigrotta (across from the Mergellina train station) that would get you up to a road that ran in bits and pieces along the ridge to the other end in the west, but the S. Antonio road was not navigable even by coaches until the mid-1600s. (Up at the top, today's long road along the ridge was straightened and enlarged in the 20th century into via Manzoni.) Thus, for a long time, you had (1) coastal enclaves and (2) clusters of houses on the slopes—small villages, which were built by settlers who had struggled up from the coast or come down from the ridge. There were four or five of these, and their names still exist in the toponymy of the area: for example, salita Villanova, via Santo Strato, cupa Angari, etc. A number of Roman ruins have been found at the western end of the coast. (The most famous of these is the large estate of Vedius Pollio —photo, below, left.) Important is the fact that the presence along the coast of these patrician villas in the age of Rome also increased the agricultural activity in the area above the coast on the slopes of the hill, and given the distance both from the city of Naples, itself, as well as from the populated areas of the Campi Flegrei, these hillside farming communities were self-sufficient quite early on. 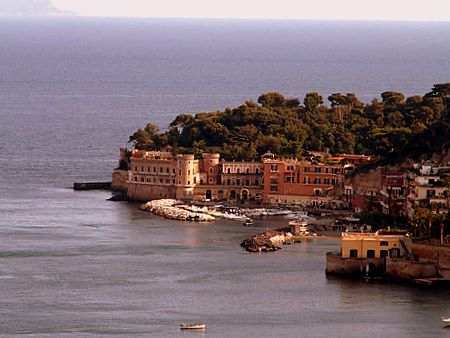 The oldest villages on the Posillipo hill are said to have been Angari and Megaglia. During the Middle Ages, they joined with the nearby settlements of Santostrato and Spollano and were referred to as the casali of Posillipo. (A casale is a fortified farm. See this link.) Under the Aragonese dynasty in Naples, the inhabitants of the Posillipo communities enjoyed a number of financial privileges that continued even under the succeeding Spanish dynasty as a means of encouraging the populace to stay out there and not move into the already crowded city. For many centuries before the Spanish fleet of the 1500s and 1600s grew strong enough to protect the waters, these hillside villages continued to grow while the earlier coastal enclaves were abandoned in the face of vicious hit-and-run raids by Saracen pirates. In addition to the agricultural settlements, a number of religious communities also took root in the area, usually as adjuncts of religious orders already established in the city of Naples, itself. They were profitable both in terms of farming and the jus piscandi—the law governing the right to fish in the coastal waters. A few other villages sprang up starting in the latter half of the 1500s: Porta di Posillipo and Villanova; at the same time, a number of new villas of the noble classes were built along the coast. During this period, as well, the nature of the monastic communities changed as they converted some of their farmland into residences, something like “vacation homes” for city dwellers from Naples. In 1718, the Austrian vice-realm, which ruled Naples for 20 years, abolished the law that forbade building outside of the city walls of Naples. With the accession to the throne of Naples of the Bourbon dynasty in the 1730s, the new ruler, Charles III, took advantage of that. Much of his new expansion, however, was to the eastern side of Naples; thus, the topographic Noja map of 1775 shows the Posillipo hill to be dotted with villas, yes, but not really connected to the main body of urban Naples. As noted, there was no road yet, until the French, under Murat, built via Posillipo in 1812. The extension of via Posillipo, by the way, called the Coroglio road, which moves down the steep cliff at the western end and winds up at the isle of Nisida, was built by the engineering corps of the imperial Austrian Army (allies of the restored Bourbon monarchy in Naples) between 1820 and 1830. The villages of Santostrato, Portaposillipo, Villanova, Angari and Megaglia were, thus, the old communities of the Vomero. The most populous was Santostrato. (A portion of via Posillipo is, in fact, called via Santo Strato) The layout of Santostrato is still evident. It was centered on a church (photo, right) in a small square. The village church, Santo Strato, goes back to 1266 and is built on the site of earlier Roman ruins. The original church was enlarged in the 1500s. Even today, it is a compact area with no road through it. A single road runs down to the church from new roads that bypass the area, but to go beyond and down to the lower reaches of Posillipo and the sea, there are only stairs and a footpath. These communities were connected to one another by paths and to the sea by trails or stairways, some of which may still be used. In modern times, a cable-car has joined Mergellina to the ridge (now via Manzoni). The most recent road built on the Posillipo ridge is the 1926 via Petrarca, one of the most scenic in Naples.